Start your children off on the right path to positive oral health. Dentistry is founded on the principle of prevention. We will take the time to learn about your oral health and help you determine the best cleaning and examination timeline to suit your needs. Have you cracked or broken a tooth? Do you have a missing tooth that you wish to replace? Are you unhappy with the aesthetics of your teeth? Our dentists can help you choose the best solution. If you are missing multiple teeth, a denture may be the option for you. Dentures can be a fine option for restoring your function and esthetics. Our dentists make every effort to preserve your natural teeth. However, sometimes dental diseases such as tooth decay and periodontal disease make your teeth unsuitable to maintain. 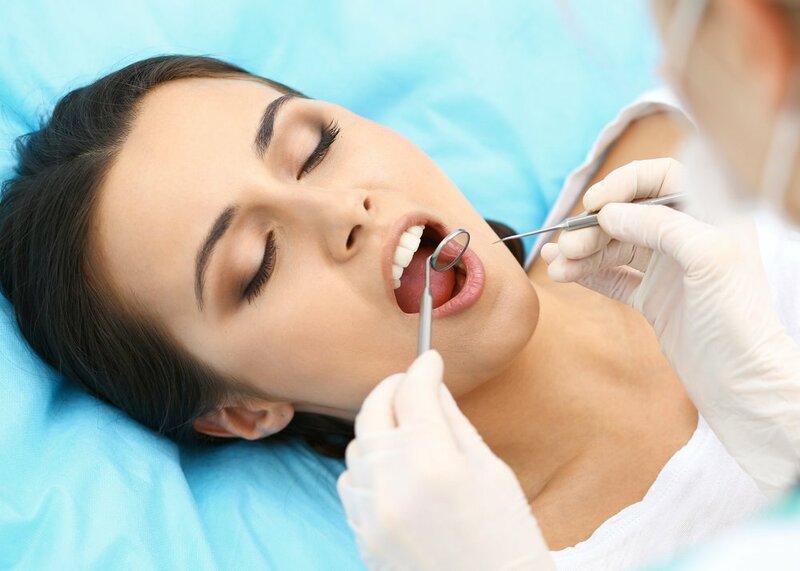 In these cases, extractions are necessary to preserve the health of your mouth and your body. Fillings, otherwise known as dental restorations, are used to prevent the spread of tooth decay or correct any cosmetic damage. Dental implants are used to mimic the form and function of our natural teeth. They can be used to replace single teeth, multiple teeth, and restore an entire dentition when needed. Dental implants can be used to help improve the support, stability, and retention of your dentures. Clenching and grinding can not only accelerate tooth wear, but it can leave you waking up with a sore neck, facial muscles, headaches, and dental sensitivity. Sports guards are used to protect your teeth and can improve athletic performance. There are various ways to correct crooked or crowded teeth without the use of traditional braces. One method works by way of placing clear, hard plastic trays/retainers over your teeth. Periodontal disease is an inflammatory disease that affects the soft and hard structures supporting the teeth. This can lead to tooth loss, mobile teeth, bad breath, and general health consequences. We create individualized periodontal maintenance programs based on individual risk factors. In most cases this can prevent, or arrest progression of this disease. Due to a number of factors, our teeth darken. These factors include age, diet, root canal treatments, genetics, trauma, and complications of tooth development. Tooth whitening can serve as a conservative way to improve the look of your teeth when color is the primary issue. Tooth ache? A root canal can be done to save a tooth that has been damaged by an extensive cavity, trauma, or other factors. Sleep apnea can have devastating effects to your quality of life with complications including excessive sleepiness, to cardiovascular and neurocognitive. Working with our medical colleagues, we can design custom appliances that can help improve the quality of your sleep. Starting your children off on the path excellent oral health by introducing them to a dental environment at an early age. At Lesniak Dental Group we recommend seeing your children for the first time as soon as the first tooth erupts (usually around 6 months), and no later than 3 years. At this visit in addition to a clinical examination is a education session for the new parents. This session will review the importance of establishing excellent oral habits, answer questions, and demonstrate techniques to optimize the oral health of your children. Maintaining your growing children’s teeth is just as important as keeping your adult teeth in great shape. Cavities in primary teeth progress fast and can lead to infection and tooth loss. This can affect the permanent teeth coming in. The best way to avoid this is to prevent it from happening in the first place. 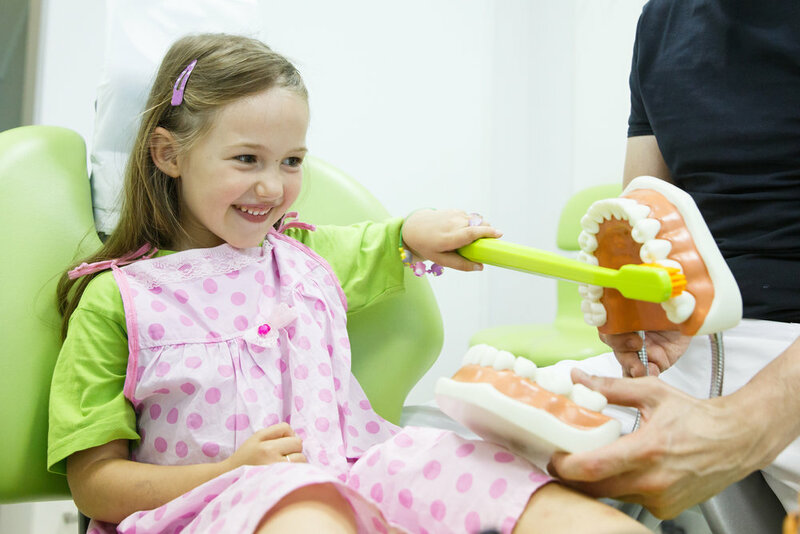 At Lesniak Dental Group, our goal of applying minimally invasive preventative care starts early. For your children, this involves regular cleanings and check ups, fluoride treatment, sealents, and optimizing home oral hygiene. Should a cavity develop, it is best to handle it when it is in small and can be predictably treated. 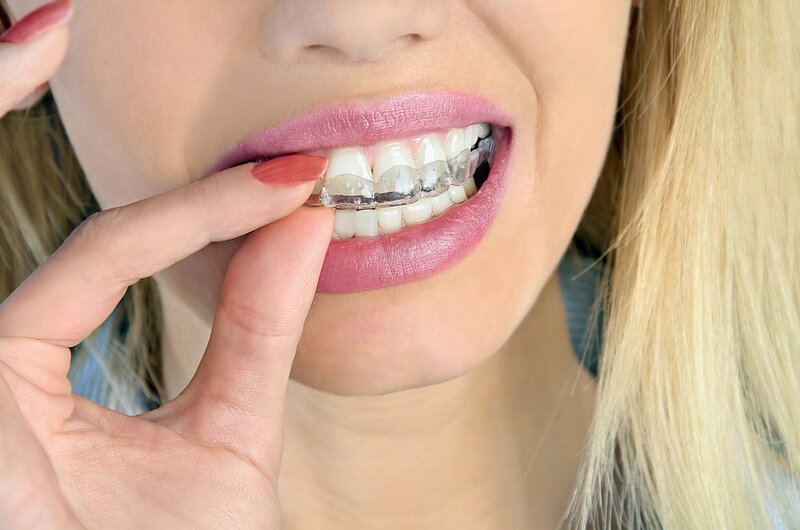 Clenching and grinding your teeth can have devastating effects to your dentition. 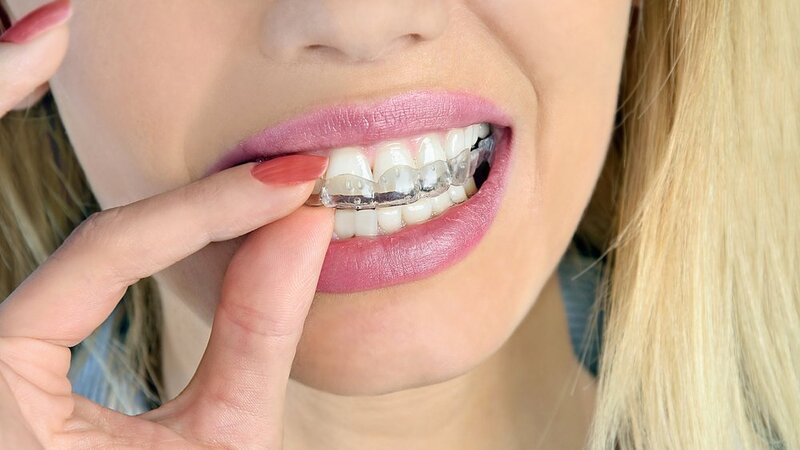 In addition to natural wear and tear, clenching and grinding can significantly accelerate tooth surface loss, result in sore head and neck muscles, produce dental sensitivity, and may cause damage to your jaw joints. 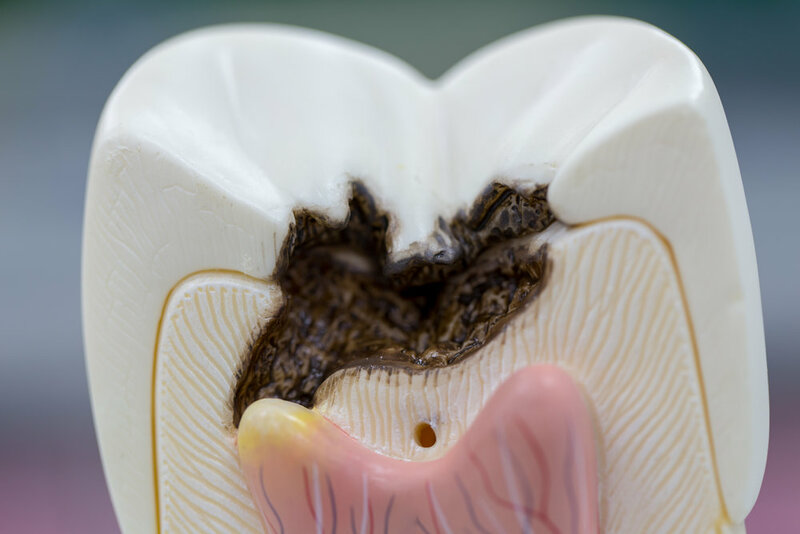 The first line of treatment is often guard that protects your teeth from this damage. Your favorite sports such as; hockey, football, baseball, and basketball, can unfortunately cause inadvertent damage to your dentition. A sports guard can help avoid, or reduce the extent of the damage caused by such an adverse event. Custom made sports guards fit your teeth and mouth precisely to improve comfort and maximize the protective benefit. Sports guards can also be used to improve your athletic performance in certain activities such as power lifting or strength training. Specially designed sports guards can be designed to protect against the clenching that gives you an extra push of strength in the gym. Missing teeth can make your chin protrude forward, lower face collapse, and cheeks appear more hollow and sunken. Your function and diet also suffers leading to malnutrition and its associated health consequences. If you are missing multiple teeth, a denture may be the option for you. Dentures can be a fine option for restoring your function and aesthetics. When combined with implant placement, dentures can nearly restore your function to that of your natural dentition. See implant dentures for more information. Depending on the number and location missing teeth, we can provide you with a variety of traditional, and implant supported removable denture options. During your consultation, we will assess all of your options, review risks and benefits, provide cost estimates, and help you choose an option you will feel most comfortable with. Partial dentures are for those who are missing some, but not all of their teeth a few. A partial denture can be used to replace these missing teeth, provide stability for your dental arch, and restore function lost by missing teeth. Dental implants can be incorporated into a partial denture to aid in support, retention and stability of this removable prosthesis. Without dental implants, partial dentures rely on the remaining teeth and soft tissue of anchorage and stability. Partial dentures can be comfortable, aesthetic, and functional if time is taken to design and fabricate correctly. Some patient require removal or have had previous removal of all their teeth due to multiple reasons including decay, and advanced periodontal disease. A complete denture is often a starting treatment of lost hard and soft tissue. Some patients adapt well to complete denture and are often aided by favorable denture supporting ridges. Other patients lack this favorable ridge anatomy and will benefit from additional implant support. In either case, at Lesniak Dental Group, we are well equipped to handle both traditional dentures, and those that are assisted by implants. Your root canal procedure should be a comfortable experience that can be completed over one to two appointments depending on the difficulty of the situation. Occasionally a course of antibiotics is also needed prior to, or after the root canal to help manage the infection. Following your root canal, a full coverage crown is recommended in the vast majority of cases. In certain situations, a root canal may be recommended prophylactically prior to placement of a crown if there is suspicion that the tooth will require a root canal in the near future. If a tooth has been heavily restored with filling material, a root canal may be required to properly restore your tooth with a foundation material followed by a full coverage crown. Fillings, otherwise known as dental restorations, are used to prevent the spread of tooth decay or correct any cosmetic damage. A filling is just one of the ways our dentists preserve your health. Before the filling itself is placed any decay, must be removed. We offer local anesthesia to numb or freeze your tooth along with laughing gas sedation (for those extremely anxious patients) to ensure maximum comfort. There are two main types of fillings: amalgam (otherwise known as silver fillings) and composite resin (white fillings). 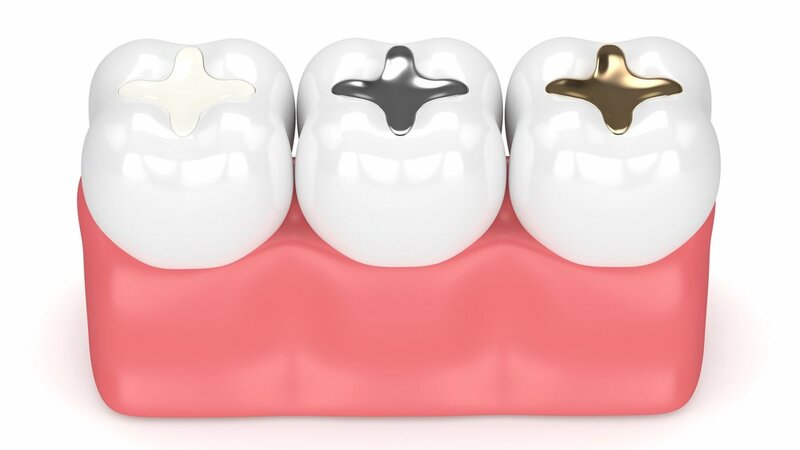 Made up of silver, copper, mercury, and tin, amalgam fillings are the most economical option for our patients. They are a great option for patients who may experience a higher rate of decay or when the structural integrity of your tooth is severely compromised. Despite the mercury content, these silver fillings have been proven to be perfectly safe. 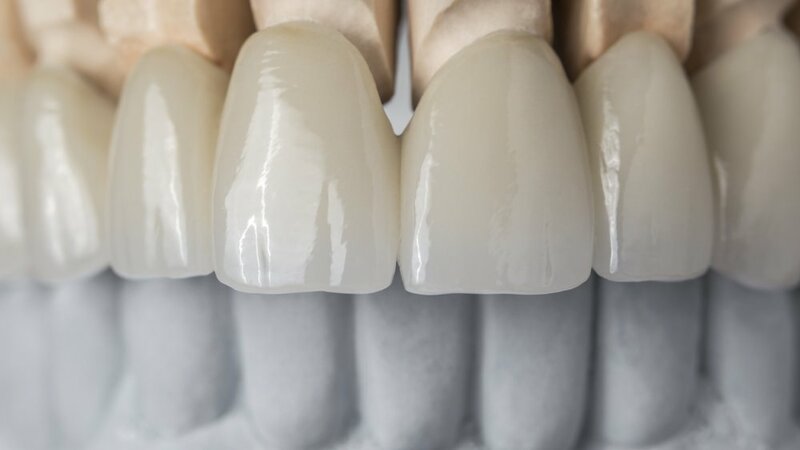 The color of a composite resin fillings can be customized to match your natural teeth. It is an aesthetically pleasing option. However, it is slightly more expensive than an amalgam filling. Composite resin is ideal for repairing chipped or cracked teeth, filling in a tooth gap, correcting dental discoloration, protecting any exposed tooth root from gum recession, or changing the shape of teeth. These filling materials have come along so far in terms of strength that we now commonly use them to fill most teeth, including molars. Implants are used to mimic the form and function of our natural teeth. Natural teeth are made up of two components: a crown and a root. The crown of our tooth is the part we chew with; it is above the gums and bone. A root is located beneath the bone and gums, and it is used anchor our crown in place. 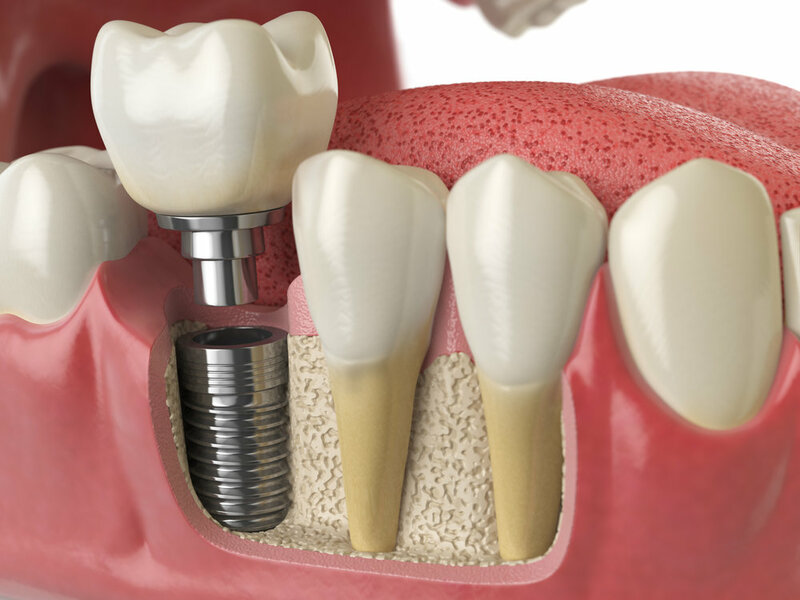 A dental implant is a titanium "root" that gets fitted into a socket in your jawbone that mimics the form and function of a tooth root. Fastened to the implant is a crown that looks and functions like a natural tooth. The new crown is customized to match your adjacent teeth and to fit your bite. Periodontal disease is an inflammatory disease that affects the soft and hard structures supporting the teeth (ie. the bone, gums and fibers that attach these things). Among the causes for periodontal disease are genetic susceptibility, smoking, and illnesses such as diabetes (especially if left untreated). Periodontal maintenance involves removing plaque and tartar/calculus (or hardened plaque) from above (scaling) and below (root planing) the gum line. Most gum diseases are preventable with proper oral hygiene. However, what can start out as gingivitis (inflamed or bleeding gums) can quickly turn into periodontitis (it's scary and more serious brother). With gingivitis, you might experience bad breath and bleeding, tender gums. This occurs as the gums pull away from the tooth to create “pockets,” thereby exposing a dental root to infection. Once the dental root and the bone anchoring the root become infected, it can lead to loose teeth, painful chewing, abscesses and other complications that ultimately lead to tooth lose. In order for us to determine your periodontal health, our initial Comprehensive Exam and annual dental hygiene appointments will include an assessment of the health of your gums, and your bone levels. This assessment begins intra-orally, where we look at the colour, shape, and bleeding tendencies of your gums as well as with measurements of the pockets surrounding your teeth. This information is then coupled with the information on your dental X-rays, which can show us the amount of space between your bone and the crown of your tooth. From there we can determine your periodontal status and suggest a suitable periodontal maintenance program for you. Some people are suggested to visit our dental hygienist every 3 months, while others can wait 12 months. The gums (or gingiva) protect the roots of our teeth. In some patients the gums can recede or wear away. This recession leads to exposure of the root surface. Sometimes the way we choose to treat gum recession is by doing a procedure called a gingival graft. This procedure involves grafting some palatal tissue (from the roof of your mouth) over the site of root exposure, or recession. This has many benefits including protecting the root from cavities, reducing recession, and improving the gingival health surrounding the tooth/teeth.